The presidency of Lyndon Johnson was a pivotal moment in twentieth-century American history. From the decisive social programs of the Great Society to the triumph of the Civil and Voting Rights Acts to the catastrophe of the Vietnam War and domestic unrest it was an era of dramatic accomplishment and wrenching tragedy. In Guns or Butter renowned historian Irving Bernstein brings those five climactic years of the sixties vividly to life from the moment Lee Harvey Oswald aimed a rifle from the window of the Texas School Depository to the tense ballot-counting that put Richard Nixon in the White House in 1968. Bernstein&apos;s book is a narrative masterpiece filled with sharply drawn character sketches and swiftly moving accounts of events that range from deals cut in the Senate cloakroom to police charging after protesters on the streets of Selma to Vietcong commandos bursting into the American embassy in Saigon. We see Johnson ordering aides Bill Moyers and Richard Goodwin to strip and join him for a skinny-dip in the White House pool where they formulate the Great Society. And we see a tired distracted president pacing in his bathrobe around a table model of the besieged Khe Sanh garrison examining aerial photographs and casualty reports. Equally important Bernstein offers a deft assessment of Johnson&apos;s successes and failures from his legislative programs to his futile pursuit of the war in Vietnam to his failure to boost Hubert Humphrey&apos;s presidential campaign in 1968. The author not only retells the maneuvering that brought the president&apos;s plans into law he also analyzes and explains their impact from the Voting Rights Act to Medicare. 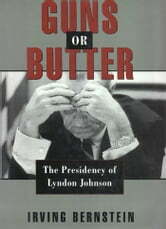 The Great Society Bernstein concludes was a triumph but Johnson&apos;s attempt to have both guns and butter to pursue massive domestic initiatives together with a bitter undeclared war led to runaway inflation that ultimately undermined his presidency. From the dark moments after Kennedy&apos;s assassination in 1963 to the heady days of legislative victories of 1965 to the bloody crescendo of riots assassinations and military battles in 1968 Johnson&apos;s administration was a defining moment in modern American history. In Guns or Butter Irving Bernstein brilliantly captures both the events and the meaning of those momentous years. Aside from its historical value this book has major current significance. The legislative program Newt Gingrich and his Republican colleagues introduced in 1995 was designed to repeal the Great Society. Before doing so members of Congress and the interested public should understand Lyndon Johnson&apos;s vision and the legislation that was enacted during the sixties. Guns or Butter provides that critical information.